1. A wooden kitchen with WOODEN toy food and dishes. Every one of our kids has spent hours and hours pretending to cook. And cheap plastic food sets often include choking hazards, and even when they don’t they’re quickly crushed, bite-marked, etc. But the wooden ones have been standing for over eight years now and are still great. They’re pricey but SO worth it. 2. Blocks. – Wooden building blocks, Duplos, soft foam blocks, etc. just something to build with. I love the soft ones the most, but we have all three kinds, and they’re played with all the time. 3. A Toy Wagon – The one we have was a little red wagon of Mega Bloks. Our girls all love putting stuff in it and pulling it around the house. 4. A few dolls and stuffed animals. – At this point we have way too many stuffed animals, but at least some of them are constantly played with. The baby dolls that have been by far favored above all the others are actually the Bitty Baby dolls from American Girl. I think it’s something about the weight of them. 5. Board books – Whether you have a plethora of money for toys or literally only three dollars to spare, head to Half Price Books and grab as many board books as you can. My girls love flipping through these on their own, and cuddling while I read to them, too. 6. MagnaTiles – Another pricey item, but we got a big set of these for our girls for Christmas a few years ago and they are still played with by at least one girl every single day! 7. A Ride-on Bouncy Animal – We have a blue deer that my now three year old named “Blue” when she was just over a year old. She climbs on him and bounces around the house every day, with great joy. 8. A Dollhouse with furniture and dolls. 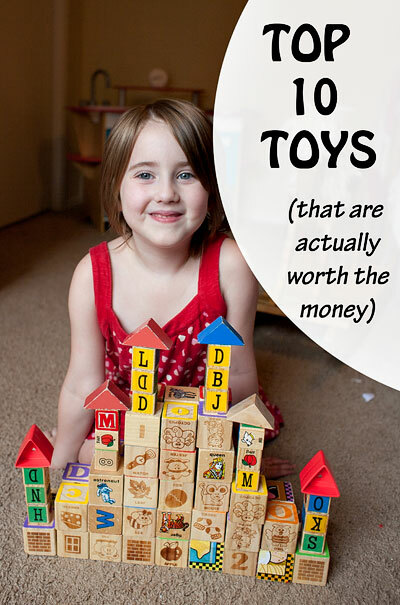 – Fortunately we’ve had friends give us these items when their kids have outgrown them because they can be super pricey, but all our girls have spent hours playing with them. 9. Soft balls in a few sizes. – I think this is a fairly obvious one, kids love to thrown and roll and kick balls. 10. Art supplies – I know this technically isn’t a toy per se but as soon as our toddlers have reached the age where they stop putting everything in their mouth, they’ve probably spent more time using art supplies than anything else. And the least fancy supplies are probably used most. Printer paper, ULTRA washable markers, watercolor paints, stickers (see my hack about removing the backing, and (once they’re old enough), kid scissors and glue sticks. There are a few other toys that have been loved by one or two of our kids. Evergreen loved puzzles and toy instruments. Boo could spend hours and hours playing with My Little Ponies. Smiles loves playing dress-up, and filling little toy purses and backpacks with toys. Apple is frequently seen clutching her Daniel Tiger figures. They’ve also all loved playing on a swingset in the backyard. Other than that, literally every other toy we’ve amassed we’ve either given away or we put away in a tub in the garage for a time and then cycle it back in for a while for the “new” factor, and then put back away once the novelty has worn off.